A look at four prefabricated housed pump stations being built on-site at Metropolitan’s Romeoville, IL facility. Each housed system is at different stages of the production process. Starting in 2016, Metropolitan recently started a 34 lift station upgrade to the city of Joliet’s SCADA system. In a continuing effort to update their aging infrastructure and growing population, we have also assisted with new, prefabricated houses at 2 of their lift stations and east side WWTP facilities. Upgrading water and wastewater systems and controls for municipalities has been a consistent part of our work for decades due to aging infrastructure. As controls and pump systems begin to fail due to wear and tear, many municipalities are upgrading to the latest technology innovations. 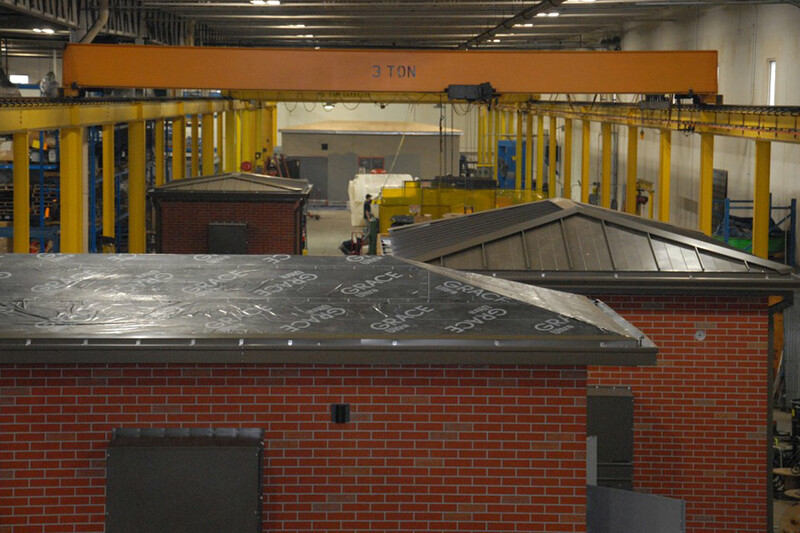 One such innovation is the ability to protect many different types of valuable equipment in a prefabricated building. Metropolitan Industries is at the forefront in providing these solutions to a variety of the challenges. Villages, towns and cities all are looking for prefabricated housed. Systems that are custom designed to meet the specific needs of the end-user. Housing types can vary according to the surrounding area and can be constructed for purposes of convenience, security, aesthetics and more. The buildings are then shipped to jobsites pre-piped, pre-wired, pre-tested and ready for immediate field connection. We have supplied such facilities utilizing a wide variety of exterior finishes and interior piping needs to match existing facilities or to give the customer’s site a brand new look. In-house fabrication of these solutions has garnered much popularity over recent years, as these structures can be designed using 3D design software to provide customers with detailed renderings of an expected finished product before the construction process even begins. At Metropolitan, we believe upgrading below ground pump stations to quality above grade solutions most effectively protects both the assets of systems and the lives of workers. We can provide solutions as part of retrofit upgrades to existing sites or as part of entirely new installations. Complete housed pump stations incorporating piping, valves, flow meters, controls, standby power and more can be provided as single source solutions by Metropolitan.